The Newest Easter Treat: Artificially Dyed Cornstarch? 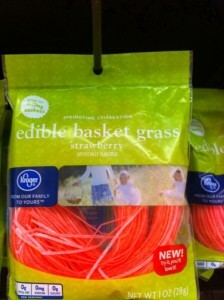 Yesterday afternoon, Small Bites reader Raquel Cordero Perry notified me of a rather peculiar product she spotted at her local supermarket — edible Easter basket grass (pictured at right)! Well aware of my obsession with ridiculously processed fake foods, Raquel (very accurately) thought I would get a kick out of this unidentified food object and sent me a photo of the product’s front package. Little did I know I was on the verge of coming across one of the most junky, artificial, processed foods I’ve encountered in quite some time. Oh, and there was more! Although the picture I originally received was for the red variety (oh, forgive me, “strawberry flavor”), Raquel mentioned that she had also spotted blue and green varieties. My curiosity piqued, I asked her if she would be so kind as to go on special assignment for me and find out more details, since Internet searches about this foolishness brought up not one iota of information. Given the nutrition information on the front of the package, I guessed that this snack (?) was probably nothing more than cornstarch and artificial sweeteners. Let’s back up for a second. The front of the package has the words “Springtime Celebration”, a “From Our Family to Yours” slogan, and a photograph of what appears to be an angelically-dressed mother and her equally halo-lit daughters running through a grassy meadow, caught in a moment of purity and innocence during an Easter Egg hunt. Really? All that production to peddle artificially dyed cornstarch under the guise of “after you make the basket, your kids can eat it!”? How did this product even come to fruition, anyway? Did someone, during a meeting, pipe up and say: “You know, I think consumers really want Easter basket grass that the kids can munch on after they’ve eaten Easter eggs all day.” Faced with concerns about sugar, this individual had an even more cracked-out better idea — sweeten it with not one, but two, artificial sweeteners. This product is further proof that there’s way too much extra corn sitting around. Now, please, go and enjoy your weekend (whether you celebrate something or not). Just promise me you won’t be munching on aspartame-laden, neon blue cornstarch. I saw this in the stores, was appropriately grossed out, and was also sure lots and lots of people would be buying this product for Easter. Sad. Andy- thanks for giving me props! 😉 It was a lot of fun going stealthy super-agent, and gathering info for this piece! I salute you and your amazing blog, information, and dedication to helping to move people in the direction of enjoying REAL FOOD, and not processed garbage. Bravo! Lynn — hilarious! And, I suspect, very accurate. I can’t even imagine putting that in an Easter basket for a kid. Yuck! I attended a seminar on Mediterranean eating a couple of years ago. There were only a couple of things that stuck with me. One was … if you can’t pronounce the ingredients, it’s not food and you shouldn’t eat it. The other was … if it has never been alive, it’s not food and you shouldn’t eat it.